In a previous post about the bathhouses in Truth or Consequences, NM (http://www.rubbertrampartist.com/2016/02/06/truth-or-consequences-hot-springs-my-experiences/), I mentioned enjoying the paintings on the wall of the private room I soaked in at La Paloma. However, I couldn’t get the formatting right to include any of my photos of the murals in the post. I decided to share those photos today because #1 the paintings are nice and #2 I am tired and possibly incapable of writing anything long and thought-provoking. La Paloma was beautiful last year when I worked there and became even more beautiful while I was gone for the winter. There are more gardens, some bird feeders, and lucky bamboo plants in every room. 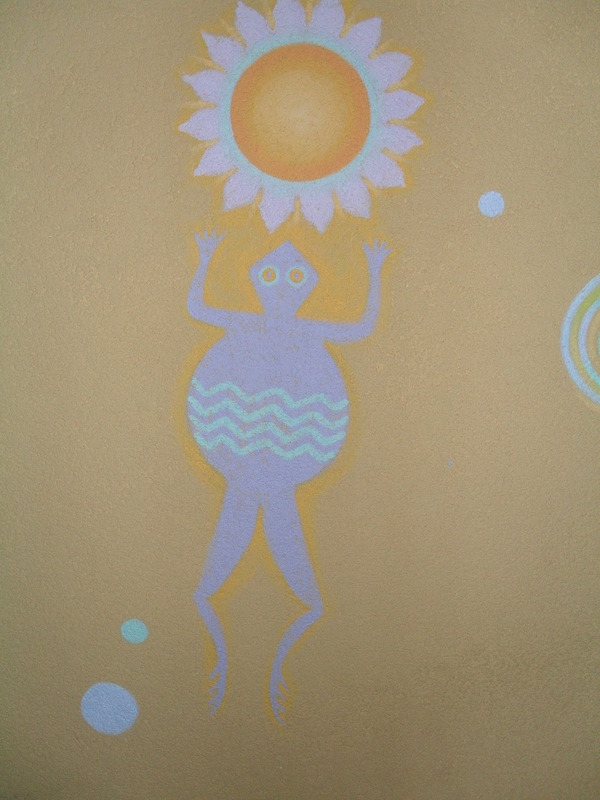 All of the bath house rooms have been replastered and repainted, and a well-known New Mexico artist, Tracy Turner Sheppard, is painting mimbres and mandalas on the walls of each tub room. Tracy is in town working on this project this week, and I’m delighting in getting to know her. 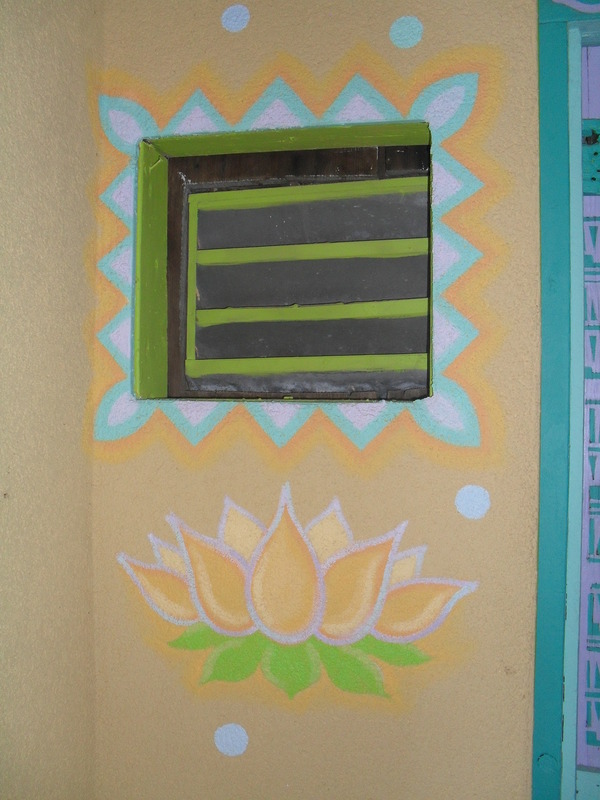 The next photo shows how the artist took an air vent and turned it into something cute and colorful. I think if something functional (and kind of ugly) has to be in a room, living with it is much easier if it can be colorful and cheerful. 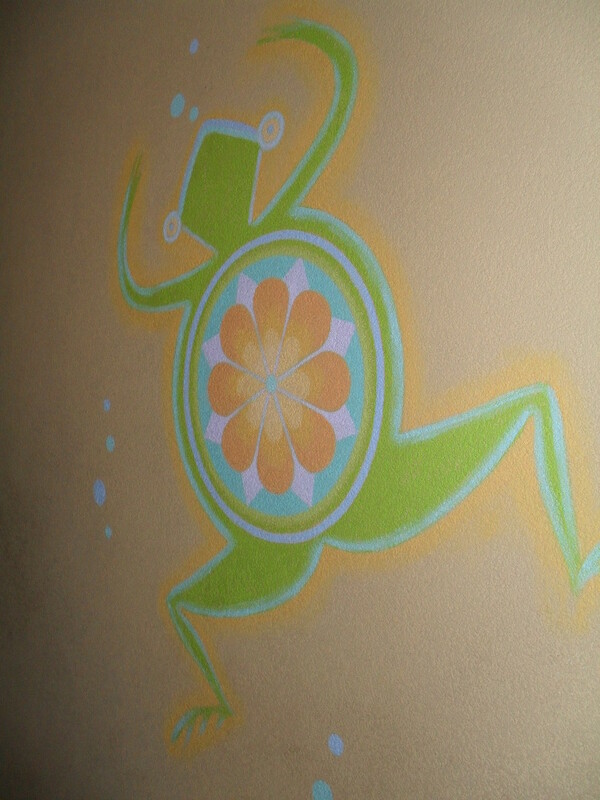 My favorite thing on the wall was this fat turtle and the decorative squiggles all around it. As a native of the west, I grew up surrounded by landscapes of astonishing diversity, light and beauty.Coming into the world this way, I developed a great passion for wild places and a love for the infinite ways color and light manifest with form on this earth. My work is a reflection of that love and seeks to express a magical reality with color as the universal language. I play with its endless variety and vibrancy, translating my own sense of joy and mystery of the physical world onto canvas. 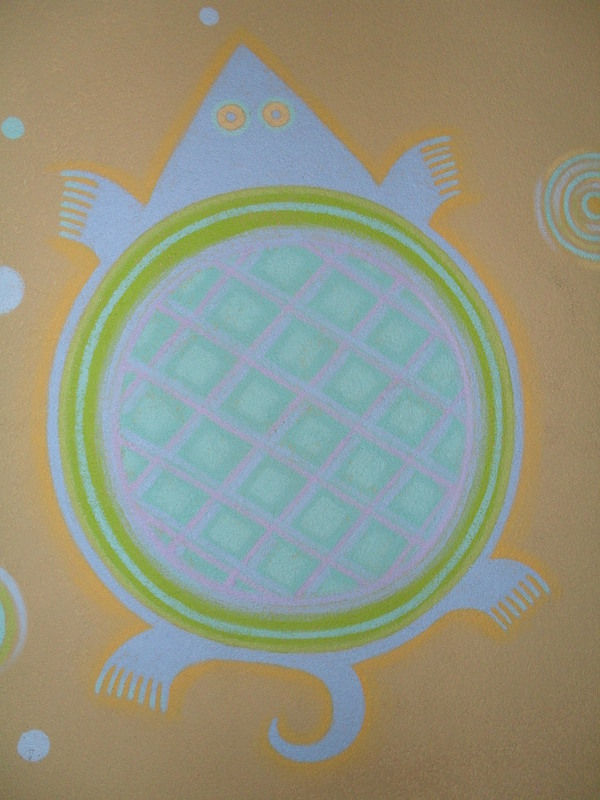 To see more of Tracy Turner Sheppard’s work, go to http://www.tracyturnerart.com/gallery.htm. I love the lavender sun and the fat-bellied reptile. Thanks for the comment and the link, Laura-Marie. You and Neruda are awesome! Maybe New England doesn’t have color because color is frivolous and the angry Puritan God doesn’t like frivolous. Or maybe New England once did have color, but it’s all faded away with time and age. Or maybe the colorful leaves in the fall is all the color New England can handle. It’s a tie between the Puritans and fall colors. These people are so stiff they don’t even move their face muscles when the talk, which is seldom. Do I have to go back? Only you can make you go back….Hugs!